I polled a few family members and friends to ask what my second recipe posting should be. Being that I recently made these kebabs this recipe was the most in demand. I love kebabs! We make many different kinds in my family. They originated in the Middle East, but have been adapted by many cultures. 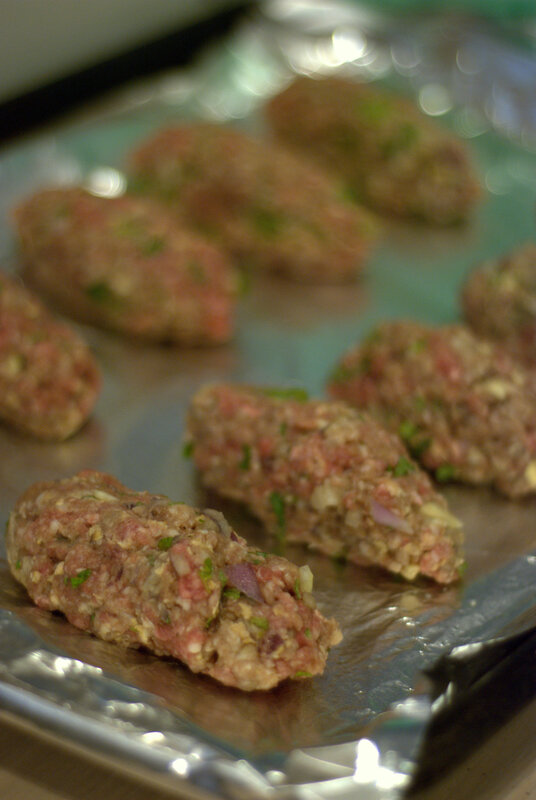 Whether they are made with beef, lamb or chicken, made with ground meat or chunks, on a skewer or off, they are a very flavorful way to prepare meat or even veggies. You can spice them up a number of ways and they are always a crowd pleaser. I must admit that I have taken some short cuts with this recipe. Kebabs are traditionally cooked and served on skewers. It is absolutely fine to place these kebabs on skewers if you wish. In the interest of time I normally skip this step. Kebabs are also traditionally grilled. You can either use a grill pan or flame grill to cook these and they would be great. The reason I cook them in the oven is to save some time and not have to baby sit them. That way I can multitask and do other things while they are cooking. I also use two of my favorite kitchen gadgets in order to save time, the lemon zester and mini food processor. This is actually a very simple recipe with few ingredients. Lamb has a very distinct and strong flavor. The mint is a great and natural complement to the lamb. 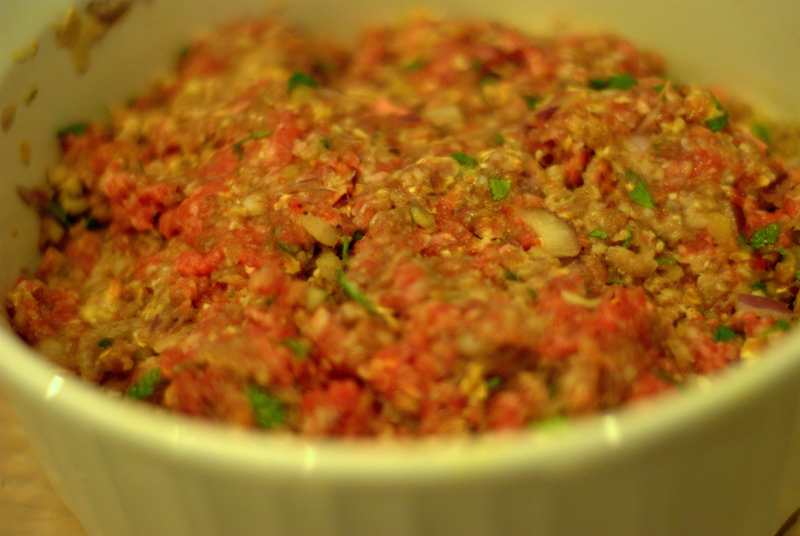 This can also be made with ground chicken or ground beef. If you do not like mint you can substitute fresh cilantro or flat leaf parsley. I hope you enjoy this dish. As always, please give me your feedback! I am particularly interested in hearing what people think about the lemon zest as I was not sure myself if it is a good addition. I can’t wait to hear what you think! In a mini food processor pulse together the onion, garlic, lemon zest and mint. If you do not have a processor you can also chop everything by hand. Just be sure it is very finely chopped. Place the mixture into a large bowl. If you are chopping everything by hand be sure to mix the onion, garlic, zest and mint together well. Add the ground lamb, salt and pepper. Mix until all ingredients are just combined. Do not overwork or over mix. Divide the meat in half and keep dividing it in half until you have 8 mounds of meat. Roll each mound into a ball and then roll the middle of the meat lengthwise until you have a short log. Place each kebab on a tin foil lined baking sheet. If you have a cooking rack you can also place them on the rack on top of the baking sheet. Cook the kebabs for 20 minutes. Turn over and bake an additional 15 to 20 minutes until cooked through. Garnish with chopped mint. 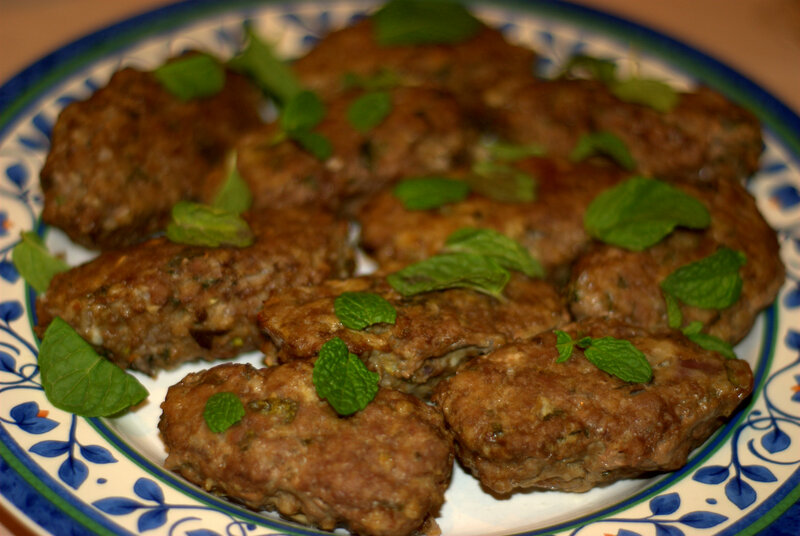 The kebabs can be served as an appetizer or main dish and served with cous cous or rice. Another mouth watering recipe, I can’t wait to make it for Josh. Can you suggest a dipping sauce, he tends to like his meat with something and I would cry if he smothered these in ketchup! Sounds just up Josh’s alley! I can’t wait to make it. Thanks! Nice recipe Mickey I would use lime instead of lemon.You can also lightly fry the kebabs.If I was doing this I would semi cook the meat mixture first.We often have this with dhall as well. Carol Elias England. Do you think you can add rice to the mixture? If you were looking to bind it you could add a bit of cooked rice especially if you are trying to be glutten free. Or you could add bread crumbs, oatmeal or matzah meal (not glutten free). I normally serve these with rice.